Wine Braised Short Rib Keto Pizza is full of flavor, satisfies that pizza desire, and has you wishing you had more beef short ribs leftover from dinner! If you love beefy full of flavor red wine roasted short ribs, then you are in for a real tasty treat today! This recipe fits the low carb high fat profile that people like to stick to when following the Keto Diet. I never cooked much with short ribs prior to last fall. Mostly because I just didn’t know much about them or how to cook them! However, I would drool over photos of fellow bloggers who were making short ribs. 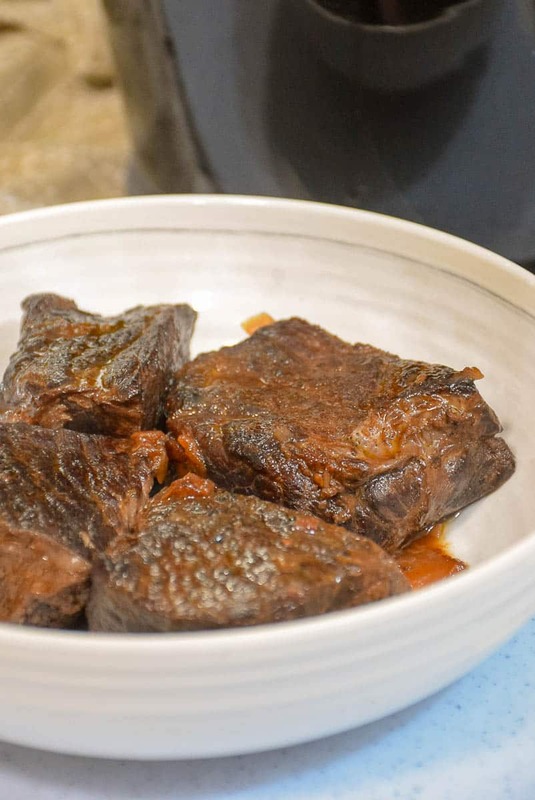 Then, I decided I had to try my hand at them and made the recipe I shared over the holidays for Sweet Chili Glazed Beef Short Ribs and was hooked. I’ve dreamt about short ribs ever since! I don’t know about you, but I have always been intimidated by the meat case. That is why I jumped at the opportunity to take a tour with New York Beef Council to a local butcher shop. I wanted to learn more about the cuts of beef and the different methods to cook certain cuts. We were challenged to take a cut home that we were not real familiar with. For me, that was absolutely the boneless short rib! Believe me, it is completely worth the wait to cook this cut low and slow! Grumpy and I will definitely be consuming a lot more short ribs in our near future. Assembling your Wine Braised Short Rib Keto Pizza! For the pizza “sauce”, I strained the liquid from the slow cooked ribs, thickened it up with a little arrowroot powder, and spooned some over top of the pre-baked keto pizza crust. Next I topped the crust with the mozzarella and Havarti cheese and added some of the shredded short ribs. I then baked the short rib pizza in the oven another 10 -15 minutes, and after cooling about 10 minutes, I top with some fresh chopped arugula. This Wine Braised Short Rib Pizza is absolutely da BOMB! Be sure to check out this link for some great beef meat case information! Decide what cut you want to buy and what recipe you want to make. I won’t blame you if you go for the short ribs first! Pin the Recipe then make Wine Braised Short Rib Keto Pizza below this pic!! I used about 1/3 cup of the sauce on pizza and 2 of the ribs. Nutrition information is only a guideline and most likely not 100% accurate for this reason. However, for those eating Keto and counting carbs each serving is approximately: 14g protein, 23g fat, 3 net carbs. This is a 20/75/4 ratio which is pretty much the ration I eat on the Keto diet. Season the short ribs with salt and pepper. In a large skillet, heat the oil over medium-high heat. Working in batches, add the ribs and cook, turning often, until browned, 7 to 10 minutes. Transfer to a large slow cooker. Add the onion and garlic to skillet and cook, scraping up any browned bits, until slightly softened, about 4 minutes. Stir in the wine and tomatoes and bring to a boil. Transfer the mixture to the slow cooker and cook on low heat until tender, about 6 hours. Remove ribs from slow cooker and shred. Set aside. Strain the cooking liquid into a large measuring cup.. Transfer to a saucepan, bring to a boil then reduce to simmer. Whisk in the tomato paste and season with salt and pepper. Whisk 1 teaspoon arrowroot powder with 1/4 cup water. Add to broth and cook until slightly thickened. Set aside. Preheat oven to 450 degrees. In large mixing bowl, microwave cream cheese and mozzarella cheese for 60 seconds. Stir until well combined. Add almond flour, salt, onion powder, garlic powder, and egg. Stir until almond flour is well incorporated into cheese. If mixture becomes too sticky, microwave another 10 - 15 seconds to warm up. Place parchment paper on large cookie sheet and spritz with cooking spray.. Place pizza dough on parchment paper and roll out thin. Poke holes in crust with tines of fork. Bake for 10 minutes. Remove crust from oven and spoon a thin layer of gravy over top of pizza crust. Top with mozzarella cheese, havarti cheese and shredded short ribs. Return to oven and bak another 10 minutes, until cheese is melted. Remove from oven and let cool 10 minutes. Top with arugula. Makes 8 servings. I would suggest making the ribs a day ahead of time in the slow cooker (and double the recipe!). Eating half for dinner and saving the rest for pizza the next day! The prep time listed here is for making the pizza only. 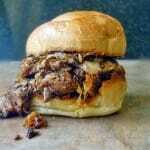 Try these Short Rib Sandwiches from Life Tastes Good! I love putting Arugula on my pizzas! I came over to check out your crust! Going to be trying this one for sure. Wow I didn’t know it was possible to make keto pizza! This recipe is perfect when you’re craving a slice! What a fun way to enjoy pizza! I love the sound of that crust. I need to make this very soon I am checking out the recipe right now! Now those ribs are cooked to perfection and that pizza look just delicious!